Determined loner Katri Kling lives in a tiny attic flat in a remote Nordic hamlet with Mats, her simple-minded younger brother. Mostly because of her unfriendly nature, the locals don’t want much to do with Katri but they do go to her when they have financial problems they need advice on. With her uncompromising attitude and her head for figures, Katri knows just how to advise people on getting the best deal. One day Katri makes a decision: she and Mats are going to live in “the rabbit house”, a striking property a short distance from the hamlet. There is one stumbling block, however: the house is occupied by Anna, a successful middle-aged illustrator of children’s books. Like Katri Anna is something of a loner but she is sociable when she wants or needs to be; whereas Katri is cold and hard, Anna is warm and sentimental. Katri sets of on a path of deceit in order to get herself and Mats into the rabbit house. Once there, she finds unanswered correspondence relating to Anna’s financial affairs that show that publishers and merchandisers having been cheating Anna for a long time. Katri persuades Anna to let her take charge of her affairs and get more money for her. As the pair embark on a battle of wills – sentiment against ambition – they each learn that they other is not what they initially thought. Who is the “True Deceiver” of the book’s title? “True Deceiver” is not, strictly speaking, a thriller but it does have a strong element of suspense and mystery. The scope of the action is limited and really very little happens but I found myself drawn in right from the beginning and I read the book (which admittedly is fairly short) in almost one sitting. I had my own thoughts about the characters and the situation and the characters’ mutual mistrust of each other only serves to increase the tension. The real beauty of “True Deceiver” is in the sparse, economic style of writing which manages to convey a multi-layered story along with painting a vibrant portrait of each of the main characters so that within just a few pages you know the characters well and your mind is teeming with ideas as to what might happen. The writing style is cleverly (and inextricably) linked with other aspects of the novel such as the setting – not just the location but the time of year – and the whole cast of characters. The events of the story take place in the depths of winter as the hamlet is almost entirely cut off. One villager skis to the nearest town to pick up supplies which are distributed through the village shop. There is, however, a sense that even when spring comes, this tiny collection of houses will be no less isolated. The people who live there know each other but there is no feeling of community that one might expect from a rural village. It isn’t specified where exactly the setting is, it could be any tiny place in Nordic Europe, but there is generally a strong feeling of Scandinavia arising from the simple lifestyles of the characters and the interiors of the houses, and the quiet nature of the characters. It reminded me a lot of the film “Kitchen Stories” set in 1950s rural Norway. The fact that the story takes place in winter only reinforces the stark atmosphere that is created by the sparse style of writing and seems to add another layer of crisp white. There are few incidental details, mostly the reader only learns what is essential to the story though that is not to say that writing is not evocative; I felt completely carried away to a tiny community in a chilly Scandinavian winter. What is really very striking is that the author uses the same skill of economy to convey both a sense of almost nothing – such as the snowy landscape – and to paint colourful portraits of complex characters. The additional characters reinforce the idea of isolation and mystery. They are all single people a fact which adds to the idea of a fragmented little society in which nobody really trusts anyone and any relationships are really just for material benefit. People are outwardly polite and co-operative but you get the feeling that they are happiest doing their own thing. Only Liljeberg the local boat-builder shows any compassion, allowing Mats to help out with odd jobs in the boatyard but the arrangement is very casual with Mats often turning up when the yard is closed and quietly getting on with jobs through the cold night. 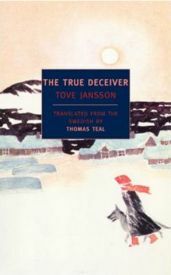 The author of “True Deceiver” is Tove Jansson. Best known for creating the much loved characters for children, the Moomins, Jansson did not begin writing fiction for adults until she was in her sixties. If you choose to, you can find parallels between Anna and Tove, who herself sometimes found the balance between her artistic integrity and business difficult to manage. Her writing here is wonderful but we shouldn’t forget that this is a translated work. The translator, Thomas Teal, deserves special praise for his work; the words run beautifully and capture the essence of backwater Scandinavia, the frosted window panes and the cold, crisp air of wintry meadows. “True Deceiver” is an engrossing and utterly charming read. I have not experienced such a rewarding read for some considerable time. No Comments on "True Deceiver"